The latest results of a new global exam given to 15 year-olds showed American students to be average in science and reading and below average in math. There were little or no gains in the last decade, while other countries raced ahead of the United States. Anderson Cooper speaks with Fareed and Amanda Ripley, author of the Smartest Kids in the World and How They Got That Way, about why children in Shanghai and Finland seem to be doing so much better. This is an edited version of the transcript. Fareed, this latest study is one of a continuing string of studies that shows the U.S. educational system lagging behind the rest of the world. What do you make of the results? Zakaria: The study is very revealing. What it shows is that while we're sort of walking around in one of those people movers going nowhere, the rest of the world, very many countries, are on escalators. What this shows is that it's not so much that we've been doing anything dramatically badly, but in the context in which everybody else is playing to win, we're falling behind badly. And all of a sudden, we look at the difference between us and countries like South Korea and Singapore and it's widening. But increasingly, the gap between us and countries like Poland is also widening. And, Amanda, you look at Vietnam, which just started this study and has a lot of child poverty, they've done really well. I mean, what are we doing wrong and what are they doing right? Ripley: It was shocking to see Vietnam for the first time ever appearing in this test at the very top of the rankings. You know, up there with Finland and Canada and Poland, Estonia, too. These are countries with significant levels of child poverty, plenty of problems. And they're not spending as much on education in a lot of cases as people in the United States is. Ripley: Right. No, we spend more than all but four countries in the world per people, and those four countries are not for the most part on the top 10 list. So it’s not just a matter of spending. It is not just a matter of goodwill. It’s not just a matter of how much testing you do or how many students you have in your classroom. It really seems to get at, you know, how have these very small number of countries managed to inject a level of rigor through and through in their system, not just with their teachers, but also with their parents and their students? Fareed, what do you see as what the United States could do better or is not doing well enough? Zakaria: Well, at one level we're just not playing to win. There isn’t a real national focus that drives down to the states that we really are falling behind. Lots of people believe we're not and we're number one and we do things great. The first thing is these countries, almost all of them, their kids go to school a lot more than we do. They have much longer school days. They have much longer school years. I did back of the envelope calculations. A kid in South Korea by the time he is 18, by the time he has graduated from high school, has spent almost two years more in high school. And when you do something for longer, whether it's music lessons, whether it's sports, whether it's academics, you're going to be better at it. Amanda, do you agree with it? Ripley: It’s complicated. Because on the one hand I think that's true in many countries, that they are spending more time in school. On the other hand, other countries are spending about the same time in school like in Finland. American teenagers, for example, do more hours of homework than some of the students in some of these countries. What seems to matter most is not the quantity but quality. They are being asked to do a lot of work that maybe doesn't actually make them think very much for themselves, and you can see that mirrored in these results where the kinds of math problems that American kids are doing well on are pretty basic problems that require them to just, you know, deliver the result. And the kinds of problems they're really struggling with compared to their peers around the world are the kinds that involve thinking, that involve taking a real world problem like, say, figuring out the tip at a restaurant and turning it into mathematical thinking. So those kinds of things that we know are really valuable in the economy today, those higher order skills are what's being neglected in the U.S. Right, that seems particularly scary. Zakaria: What's most scary about it, along those lines, is that until about 10 years ago, one consolation was the very best American students did pretty well. 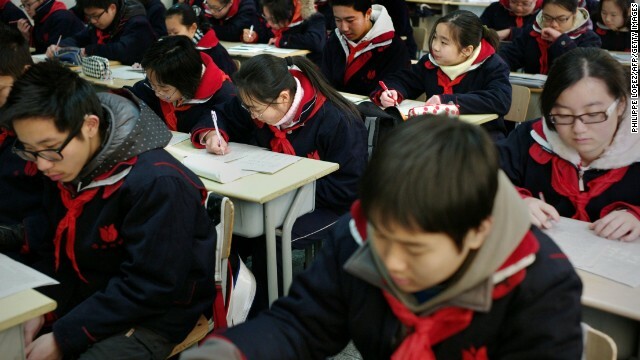 We ranked, the best kids in Massachusetts were up there with Singapore and South Korea. No longer true. Even our best students are no longer at the very top. They're doing OK. But they're not up there with Shanghai, Singapore, and South Korea. Does some of this have to do with how education is funded in the United States? Zakaria: The simple difference if you were to look at all these other countries, particularly the good ones, in those countries they spend more on poor kids, on kids who are disadvantaged, on the theory they're the ones who need the most help. Our system, as you know, is funded by property taxes. So we do the opposite. We tend to spend lots of money in affluent suburbs, we spend relatively less money in inner city places. And that means those kids, those disadvantaged kids really never have a chance to catch up. So, Amanda, what is the takeaway on this? Ripley: Well, I think it's true what Fareed is saying. We could do much better on equity, we should put much more attention into raising the bar for who gets to study teaching in college and how rigorous that training is. And I think the fact that 45 states have agreed on a set of common core standards which are more rigorous and aligned to international norms, if we can keep pushing through all the controversy around this and get to a good place, that's a huge step in the right direction. « Previous entryCan an ad bridge a divide? Is the current generation of American kids just plain STUPID? They are not stupid, they are ALLOWED to be stupid by parents, school systems, teachers, and peers, and that is way easier, than being held accountable and being smart. Get rid of the teachers unions and evaluate the teachers performance, more money is not the answer. In a country where we glory such people as Paris Hilton, Kim Kardasian and Honey Boo Boo, is it any wonder that education takes a back seat to marketable stupidity? need to hold the students and their parents responsible for the students' education. if the students don't want it and their parents don't care, then it doesn't matter how much money you throw at this problem, it won't improve. Don't worry about hurting the students' feelings because the real world won't. How about they can't teach ? Lets see which country the kid can throw a football is making more and get a free drive to college. Do you see any event for kids get sign in MIT or harvard or yale but you do see event kids sign to play for pennstate or any college. I bet you pay for cable so look in the mirror to see who is support for what important. Don't bring sports into the conversation, especially when you mention college sports because believe it or not, NCAA sports have brought billions into the colleges and universities here in the states and helps pay for academics. This article is about the way we go about teaching our kids here in the U.S.. We're not strict enough or put the right emphasis on subjects like science, math, engineering or anything for that matter that involves critical thinking. We spend more per child than most of the countries mentioned in this article so that's not it. Unfortunately for the kids what this should mean is more time in class and more higher learning. Now if you want college sports or the networks that broadcast all these games to pay more toward education as a whole thats a different story. totally agree– I would also add that our "pass everyone approach" is not preparing our children nor is encouraging our children to be innovative- being innovative means you will run into barriers, stumbling blocks, you will make mistakes- look at how many versions of apple and microsoft we have had– all in a means of improving. If we prevent children from failing then we produce a culture of "anxiety" around "failure" when barriers, mistakes are apart of life. Related- if we don't correct/evaluate kids when they are young we dont prepare them for the workforce- I have North American born kids that have masters degrees that have never had anyone correct their spelling/grammar- so they can't handle peer review/comments and their writing skills are horrible. We have to stop codling our children and start to prepare them for life- its the kindest things we can do for them. "Lots of people believe we're not [falling behind] and we're number one and we do things great." Arrogance is a major problem for our country. Too many people think it's more important to believe we're the best than actually be the best. They bury their heads in the sand with respect to what's happening in other countries, tell themselves we're #1, and if you dare challenge their fantasy they tell you that if you think things are so great in another country you should move there. Health care and education, two of the most important bases in our quest to succeed and enjoy life are areas where we've fallen behind many other countries, and as long as a significant number of us refuse to admit there is a problem you can bet we won't be addressing it in either policy area. I disagree with this article. The US spends too much time trying to raise the common denominator and not enough time advancing our top students. The tests encourage teachers to only focus on the kids who will not pass without help, and ignore the students who may actually become valuable contributions to society. An inordinate amount of money is spent on special education and remedial work. This money should be spent on the honors, AP and gifted children. I agree with "engineer" about not worrying about hurting students' feelings. In most countries with exceptional education, high school is only for the best and brightest. We don't need to pay more money, we just need to stop wasting it on low, average (C-students in non-honors classes), and special education students. These kids should be put in vocational schools. This would allow plenty of money for our achieving students. Without the low standard that exists with No Child Left Behind, we could reach the high standards of the top preforming countries. No Child Left Behind is wasting funds on kids who should be left behind, leaving the best kids behind, and making this country behind. You can say that this is harsh and insensitive, but it is reality. Right now, the "American Dream" of equality and equal opportunity is causing the downfall of the USA. Exactly. We waste too much time and effort on those who are unable or unwilling to learn. And in fact, this approach doesn't even help below the average students. They waste 4 years in HS which could've been used to learn a trade and become self-sufficient. Some of them even go to college and waste even more time and money. All the while the brightest students are not developed to their best potential. This is the exact opposite of what is the most other countries are doing. They have limited resources and they chose to use it on the best students because this is where the best ROI is. The teachers do not know and see the best students. They're just there to collect pay and wait for the retirement. No disciplence becuase of complaining parents, no vision when they have no training and no say to a football player. etc... They're just a clueless. Teachers were used to be a passion but the dollars and job security were chancing that for a decade. It's starting to show. The problem we have is NOT trying to educate everyone, it's trying to educate everyone the same. In most of the countries at the top of education, they require tests to be passed along the way. (around 8th and 10th grade). Other "pathway" tests which allow students to excel in areas they are most suited and focus on education in these areas are given as well. This allows these countries to focus education in a way we do not. ALL children can learn, but they don't all learn the same! We can blame teachers, parents, the kids themselves, but until we address the fact that we are giving tests to kids who have no business taking them and then comparing them to the rest of the world, we will never be in the top. Our kids are falling behind – that is the kids who go to public schools because, of course the schools are run by Liberal Progressive Leftists and Unions. What is it about government that you folks don't get? The Liberal movement in this country has destroyed the family unit. The one thing the other countries have that we are slowly losing is parents that actually parent. Until adults stop caring more about there own self fulfillment and begin focusing on raising their children, we will continue our slow slide into becoming a second rate nation. While not wishing to interrupt your sleeping brain, what in hades does "the liberal movement" have to do with my family unit. If my family unit fails, it will not be because of politics. It will be because he keeps giving me food processors and hockey tickets for Valentines Day. Uh. All those other countries that are doing better than us? Every single one of them is a lot more liberal than us. It kinda pays to pay attention to the facts when trying to solve problems. Personal biases based on falsehoods never produces good results. I think we might have some idea why our nation is failing so badly if we look at the difference between both parties's approaches to solving problems without our biases interfering. Liberals and conservatives BOTH have skin in this game, and it's best if our kids do better in school regardless of whether we're conservative or liberal, so we should probably pay attention to the things that actually happen rather than the things we imagine are happening. We may be falling behind in education but DAMN we're good at video games. I bet our kids have the most athletically toned thumbs in the world. Ripley, you should have brushed up your international studies before you said Finland and Canada have significant levels of child poverty, plenty of problems. Arrogance begets arrogance. Ignorance begets ignorance. Isn't that relevant in this context? The reason it looks like we are is because blacks and hispanics are bringing down our test scores. Do you really think that if we tested only white kids our scores wouldn't be much better? Our nation is to afraid to admit it, but the reason we're getting worse in everything is because we are coddling the minorities instead of telling them that they need to actually earn a place in this society. American schools closing due to lack of funds, but foreign aid continues. Common Core is NOT good! What is is doing is holding our smartest students BACK! They are not allowed to get the advanced schooling they might need in some areas because they need to meet all Common Core before they can advance in any area! And don't try to tell me different because my grandson is 7 with an IQ of 144, a wiz at math and science. But because he is only moderately above in English he can not advance to higher math! So you tell me where Common Core is an advantage to our smart kids? I was married to a research engineer who had a fascinating unbalanced intellect – impressive in math since elementary school and semi-pitiful in most other areas. This imbalance never improved over the years. We had to hire tutors to get him through required non-math courses in graduate school. Since this is obviously genetics-based, I agree with you. Advanced courses should not be restricted to only those with balanced competencies. I don't know the educational system; but I do know the culture and the learning atmosphere are definitely having a problem. When Summer break was approaching, the teacher told my son that he didn't spend any time on learning; instead only enjoying the two months summer break. so what is wrong in terms of our educational system? And who has had an iron grip on American public education for decades now !!! I recently read a great article talking about Finland's educational system. One of the key points they noted was that the kids in Finland (even the druggies) knew that there was a clear expectation for them to do well and they knew that doing well in school was THE road to success.